Cameron Webb and the Department of Medical Entomology have been engaged by a range of insect repellent and insecticide manufacturers, as well as local health authorities, to provide testing of products and provide expert advice on biting insect biology and control. Tick bite poses a potentially serious health risk in itself but sometimes the way people try to remove ticks just makes things worse. This is because urban myths and conflicted advice from local and overseas health authorities have created confusion among both health professionals and the community. Of the more than 70 bloodsucking arthropods known as ticks that live in Australia, the paralysis tick, Ixodes holocyclus dominates when it comes to interaction with people. This tick is most commonly found in wet sclerophyll forests along the east coast. While their life cycle (including egg, larva, nymph and adult) can take a year to complete, adult ticks are most commonly encountered in the spring and early summer. Ticks don’t jump or fly. They find a host by climbing to the top of grasses or other nearby vegetation and slowly wave their legs about until they make contact with a passing potential host. They’re commonly associated with ground-dwelling mammals, particularly bandicoots, but can potentially be found on a range of wildlife. Once they’ve found a host, ticks take a blood meal to obtain nutrients to either moult to their next developmental stage or, in the case of female adult ticks, develop eggs. They can stay attached for up to ten days while feeding. Reactions to tick bites can vary from a mild itching with localised swelling, to severe allergic reactions and life-threatening anaphylactic condition. A recent study of 500 tick bite cases presenting to a hospital on Sydney’s northern beaches reported 34 individuals with anaphylaxis, 40% of whom had a history of allergy or previous anaphylaxis. There’s currently an acrimonious debate about the presence of tick-borne pathogens that cause Lyme Disease or a “Lyme-like” illness in Australia. 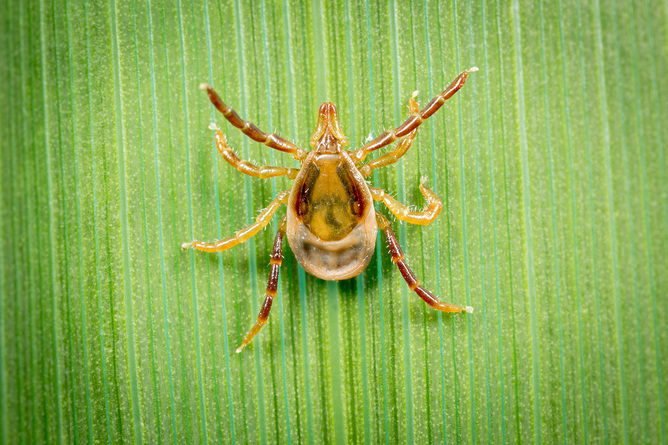 No causative agent has been isolated from local ticks or wildlife, and Ixodes holocyclus has been shown to be unable to transit the strain of bacteria that causes Lyme disease. But other tick-borne pathogens, such as Rickettsia and Babesia, have been documented in Australia. Infection with these pathogens typically results in a “flu-like” illness of varying severity but there will be a range of pathogen specific symptoms. Notwithstanding pathogen transmission, there are other well-documented health risks associated with ticks. Potentially fatal tick paralysis is a serious concern, as is mammalian meat allergy. Mammalian meat allergy is triggered in some individuals by substances in the saliva of ticks injected during feeding. People who have an allergy to this may experience life-threatening anaphylaxis following the consumption of red meat or, in some instances, other animal-derived products, such as milk and gelatin. There has also been some debate in recent years about the best way to remove an attached tick, with opinions divided between killing the insect in place or forcibly removing it. It has been suggested that forcibly removing the tick may increase the severity of any allergic reaction. The absence of clinical trials has led to uncertainty, as has advice from overseas health authorities that may not be appropriate in Australia due to differences in our ticks. There’s no doubt the advice provided by health authorities in North America and Europe are suitable for those regions. They suggest quick removal, using forceps or other devices, to reduce the likelihood of pathogen transmission. But the species of ticks prevalent in those places are not associated with possible tick paralysis or potentially serious allergic reactions caused by Ixodes holocyclus. Australians need a different approach and there’s growing consensus that killing the tick in place may be best way to minimise the risk of severe allergic reactions. Killing ticks is tricky. Some insecticides may be effective but involving any substance (such as methylated spirits, nail polish, alcohol or petroleum jelly), or physical disturbance (such as the use of forceps) that agitates the tick is likely to cause it to inject more saliva and toxins into the skin, resulting in a more severe reaction. The Australasian Society of Clinical Immunology and Allergy (ASCIA) recommends using aerosol “freezing” sprays normally associated with wart treatments. These products are widely available from pharmacies and they rapidly kill the tick in place, minimising potentially serious reactions. Once killed, the tick can then be left to fall out naturally. What we really need are clinical trials assessing the effectiveness of these currently recommended tick removal techniques and the likelihood of preventing or minimising allergic reactions. Fortunately, this is the focus of the recently formed Tick-induced Allergies Research and Awareness (TiARA) group. Clear tick removal guidelines, supported by research and clinical information – or both – will hopefully adopted by local health authorities and put an end to confusion.